Nicky Henderson’s Top Notch is a warm order to land the Timeform Morebattle Hurdle at Kelso today. A neck second to stablemate Peace And Co in last year’s Triumph Hurdle, he faces just three rivals in the £25,000 feature race at the Borders track. David Pipe-trained Grand National entry Soll also takes on four opponents in the Ivan Straker Chase. “I’ve fond memories of Kelso as I had my first winner as a trainer there in 2006,” Somerset-based Pipe said. 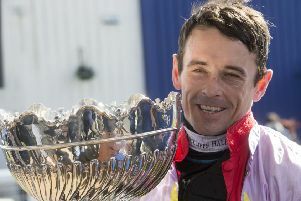 Tom Scudamore, who partners Soll, reached a milestone at Musselburgh yesterday when he rode his 1,000th career winner on Impulsive American in the racinguk.com/anywhere Maiden Hurdle. Soll’s most likely rival is Corrin Wood who, despite his lack of recent good form, may be worth a small wager.